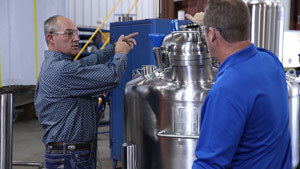 At IEP (Innovative Engineered Products), we’re moving manufacturing into the future. 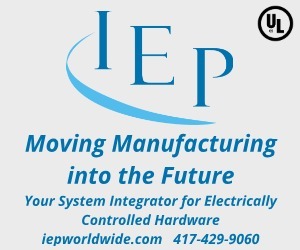 IEP is a private, family-owned business stationed in Fair Play Missouri, providing system integration with today’s top automation systems through engineering, fabrication, programming and onsite installation start up and testing for equipment manufactures and production facilities alike. Our unique ability to listen and design customized solutions, to maximize needs and scheduling challenges, allows our customer’s to be very successful. From a simple device replacement to a complicated conversion, regardless of brand, the IEP team can take your operation into the future. When we approach a customer, we strive to make you a customer for life. We are committed to our customer’s success by providing the highest quality service, innovatively customized solutions and outstanding partnerships. IEP serves manufacturers from the Springfield Missouri area and beyond. Our team reaches customers from Aurora MO, Benton MO, Bolivar MO, Branson MO, Brighton MO, Buffalo MO, Carthage MO, Coffeyville Kansas, Fair Play MO, Half Way MO, Hollister MO, Joplin MO, Kansas City, Lebanon MO, Monett MO, Nixa MO, Ozark MO, Parsons Kansas, Republic MO, West Plains MO, and Willard MO. • The IEP sales team offers 35 years of combined experience providing excellent products, services and long-lasting partnerships. • Our engineering staff back their services and knowledge with 45 years of combined hands on project experiences in both the OEM design and implantation to MRO projects and migrations. • Our fabrication, installation and checkout team, who are comprised of 30+ years of experience to today’s young and ambitious proudly pushing us to new ideas and efficiencies. Being blessed with our training abilities, we continuously educate our cordial, highly motivated individuals to create a continuing resource of knowledge and support for our perpetually growing needs, as well as our partners uniquely changing requirements. Call 417-429-9060 or Visit us at https://iepworldwide.com/ to get a free estimate.